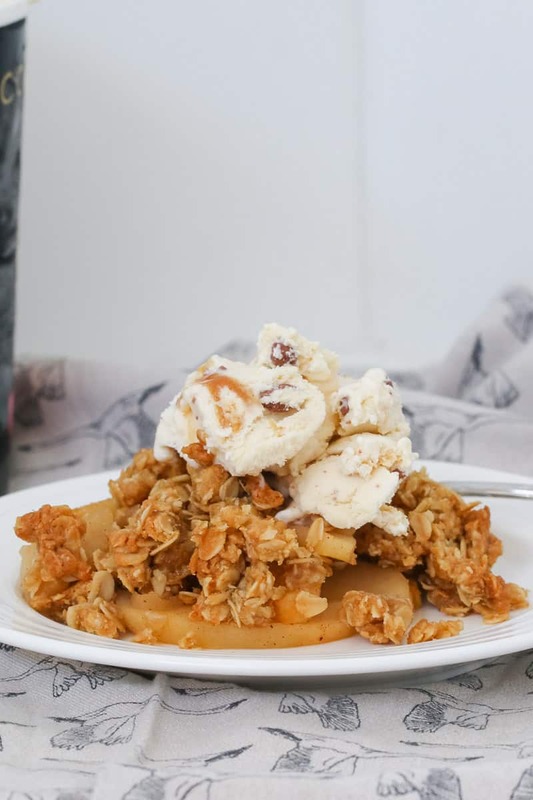 The ultimate apple crumble recipe.. a sweet apple filling with a crunchy oat topping. Serve with ice-cream for the perfect winter dessert. 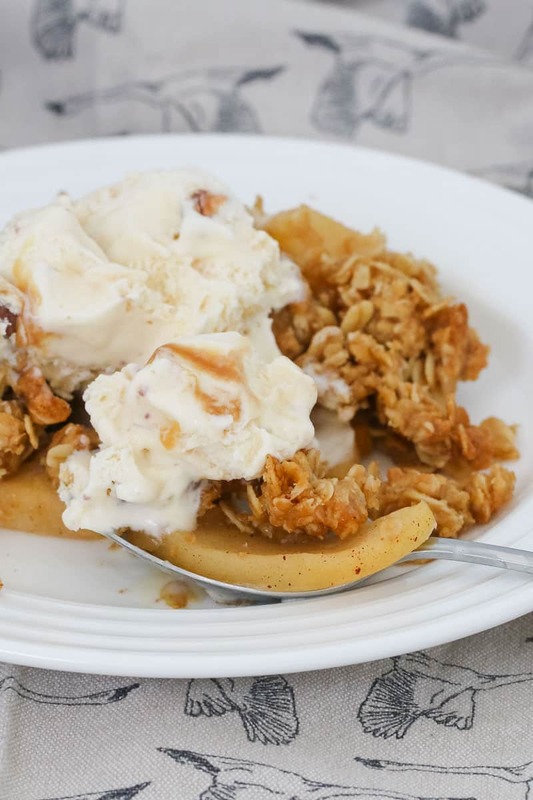 I have a confession to make… I have a slight addiction to apple crumble. 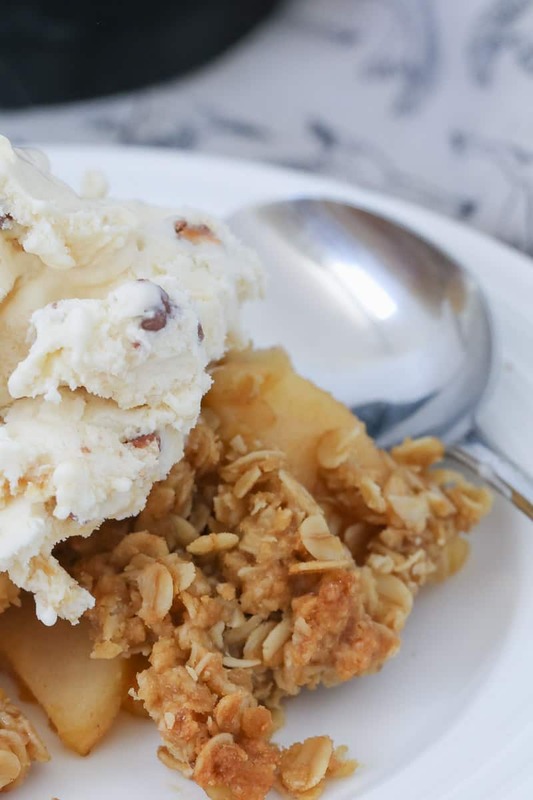 There’s just something about deliciously soft apple topped with a crunchy sweet crumble that makes me drool. Oh and of course a good scoop of ice-cream on top makes everything even better! The best thing about this recipe is that it’s super budget-friendly and is made from basic pantry ingredients. 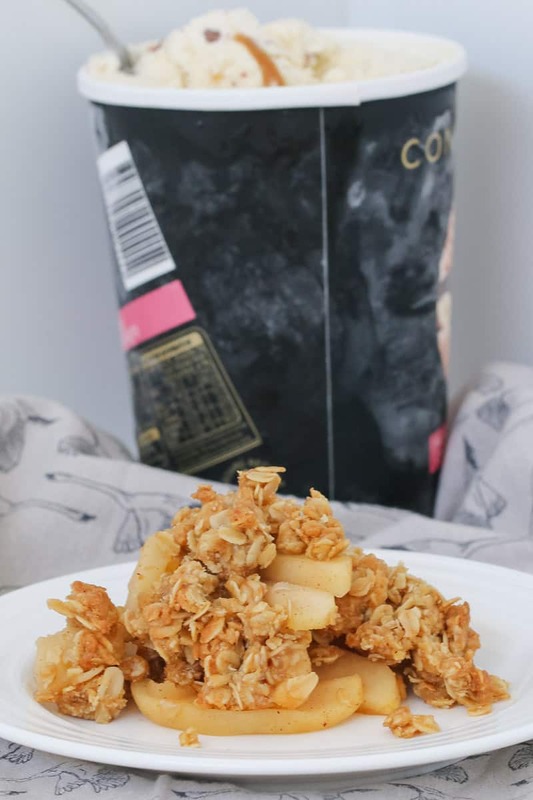 This is SUCH an easy homemade apple crumble recipe… quick, easy and no-fuss! Cook the apples with the water, cinnamon, nutmeg, sugar and lemon juice in a saucepan until just softened. 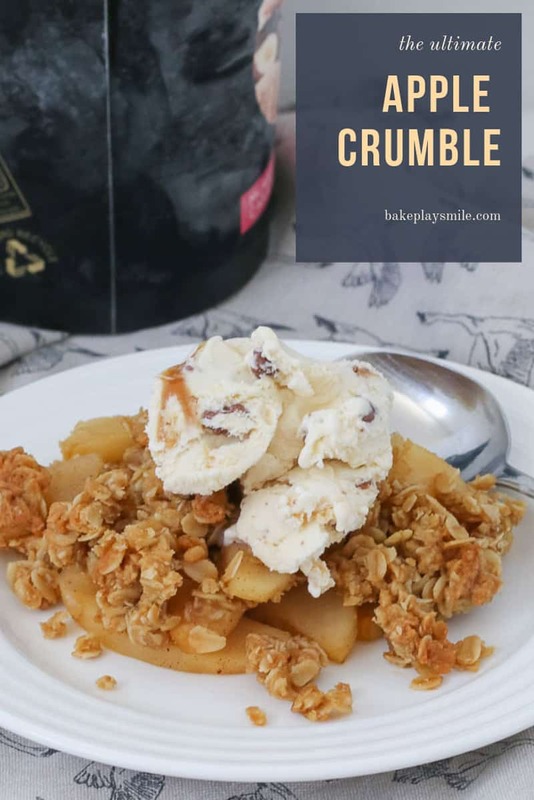 Make the crumble by using your fingers to squish the rolled oats, plain flour, brown sugar and butter together until all of the butter has been evenly distributed (check out the video below for tips). 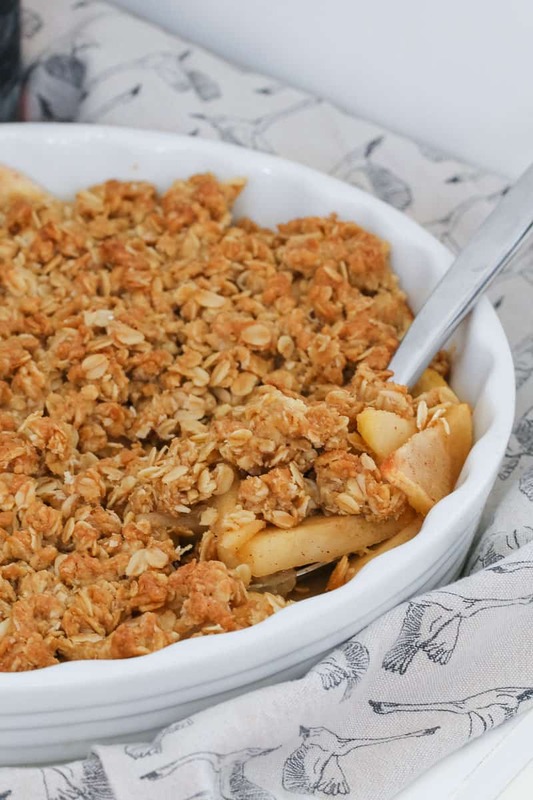 Sprinkle the crumble over the top of the cooked apple and bake in the oven until golden. That’s the secret to the the perfect crunchy and crispy crumble !! 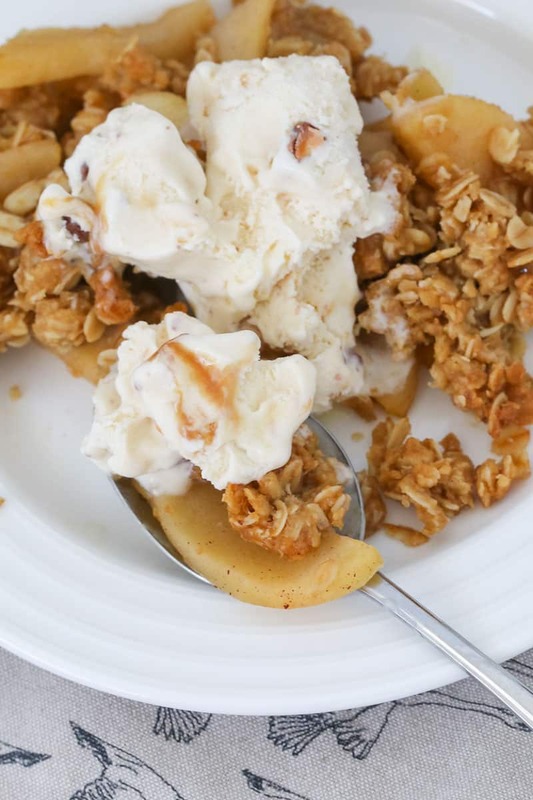 What type of apples are best for apple crumble? 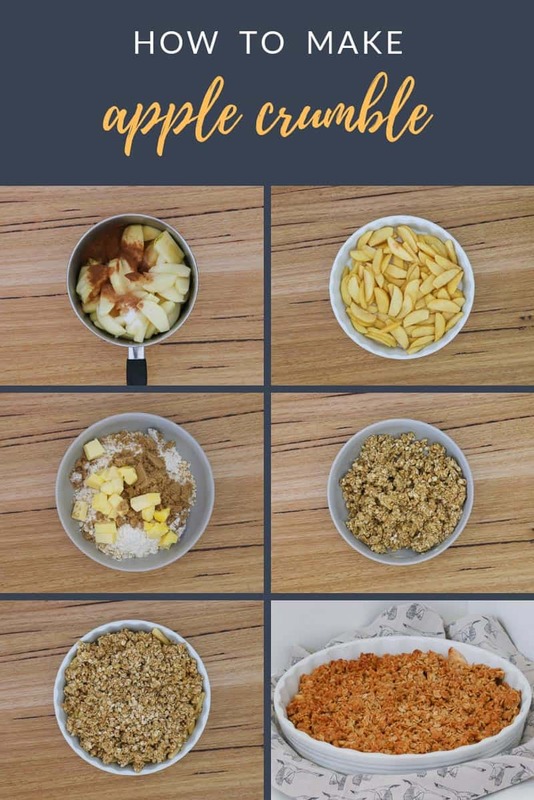 You can use pretty much any type of apple you like for this recipe! You can’t beat a big bowl of dessert on a cold winters night… right!? 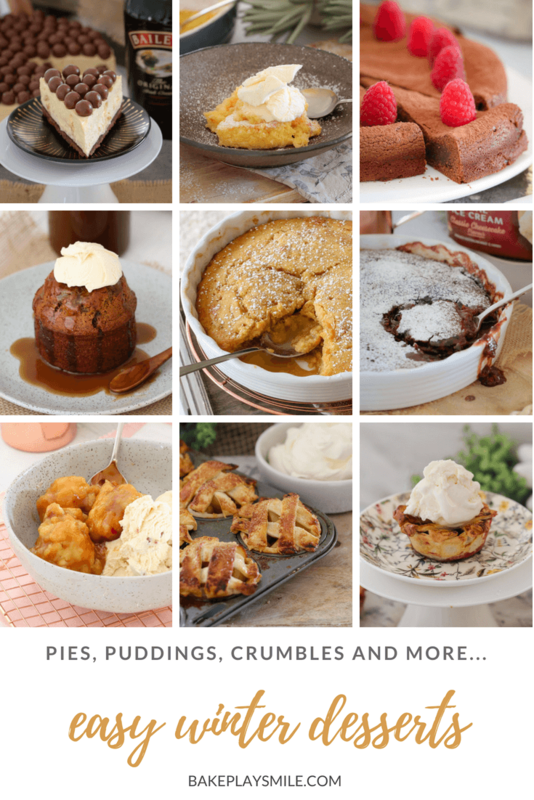 Check out a few of my favourite winter desserts here! Preheat oven to 200 degrees celsius (180 if using fan-forced). Grease a large baking dish with butter and set aside. Place the peeled and sliced apples into a medium saucepan with the water, caster sugar, lemon juice, cinnamon and nutmeg. Bring to a low simmer for 5-10 minutes or until just softened. Drain off the excess liquid. Place the stewed apples into the baking dish. 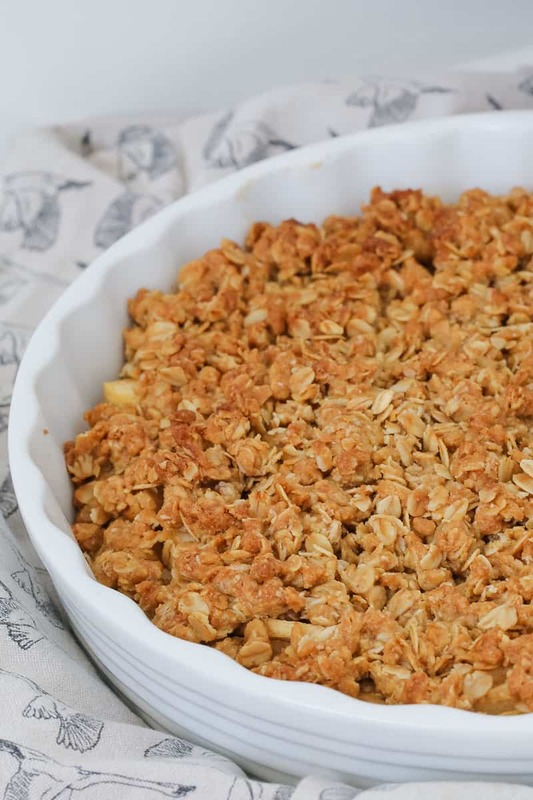 To make the crumble, place the oats, brown sugar, plain flour and butter into a bowl. 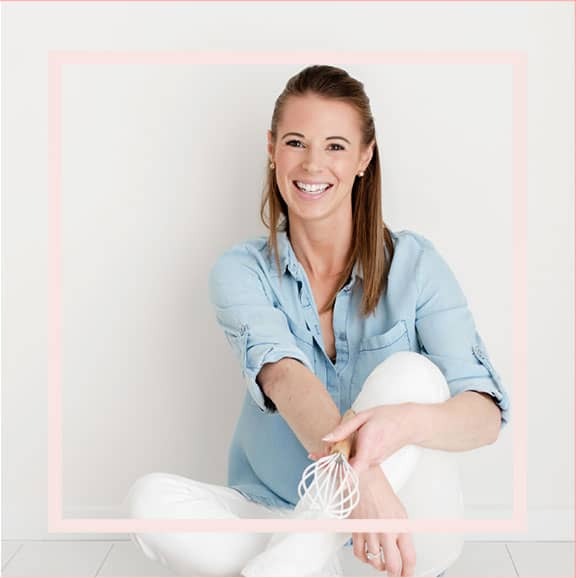 Use your fingers to squeeze and break up the lumps of butter until crumbs have formed and all of the oats and flour are completely combined with the butter (there should be no loose bits left!). 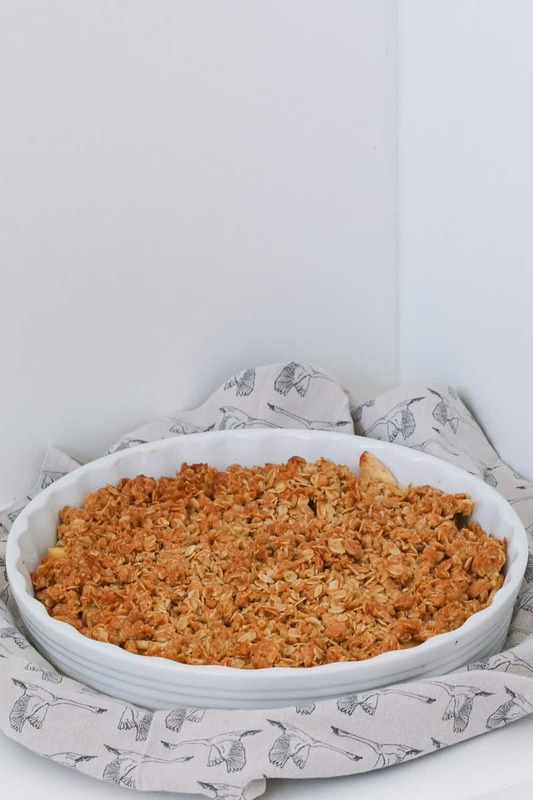 Sprinkle the crumble over the apple and place into the preheated oven. Cook for 35-40 minutes or until the crumble is golden and crunchy. Serve immediately with ice-cream or cream. Place peeled and sliced apples into the Thermomix bowl. Add the water, sugar, cinnamon, nutmeg and lemon juice. Cook for 5 minutes, 90 degrees REVERSE, Speed 1. Drain the excess liquid from the apples and place into the prepared baking dish. Rinse and dry the Thermomix bowl. Place the oats, flour, butter and sugar into the Thermomix bowl. 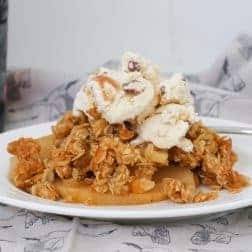 Press Turbo a few times until you have achieved a consistent crumble mixture (and all of the dry ingredients have been completely combined with the butter. I agree Kat – so yum!! The perfect dessert, especially in winter. This looks magical Lucy! Oh thank you so much Jess! Oh yes absolutely! 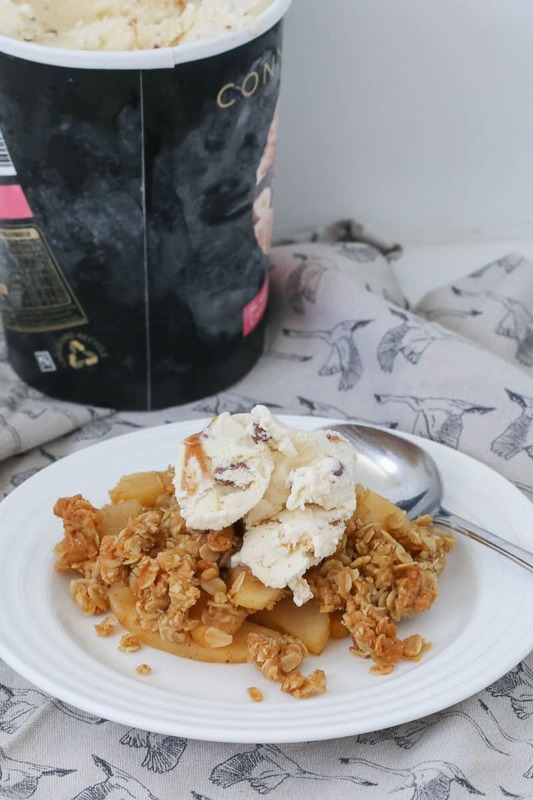 I’ve definitely been known to eat apple crumble for breakfast… I add yoghurt so it’s totally ok hehehe! I LOVE apple crumble and constantly crave it when it gets cold. I will be definitely giving this one a go! Oh absolutely!! That and self saucing pudding or sticky date! Yum!